From California to Russia to India, drought affects countless lives every year, and can cause famine and civil unrest. Impoverished regions are the most susceptible to the harsher consequences of drought, where relief can depend on the generosity of foreign nations and agencies. A new rainfall monitoring dataset known as the Climate Hazards Group Infrared Precipitation with Stations, or CHIRPS, is designed to provide the earliest possible warning of drought to those who need it most. Developed in partnership between University of California, Santa Barbara and the U.S. Geological Survey, CHIRPS combines Landsat satellite and ground station data from present and past to gain a better understanding of future rainfall patterns. “The whole point of the dataset is to be able to take recent droughts and place them in a historical context,” said Chris Funk, research geographer with the USGS. Funk also serves as a researcher at the University of California, Santa Barbara. 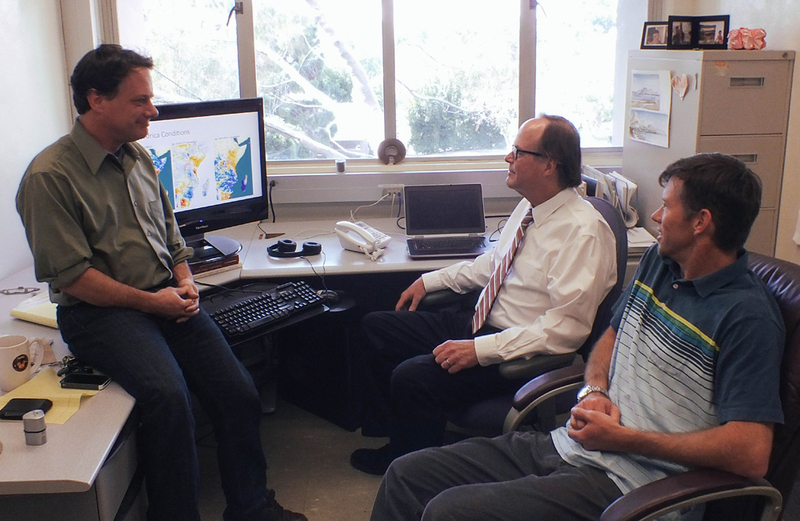 “There’s been a long relationship between Santa Barbara and the USGS because the original sensors for the Landsat satellites were developed here,” Funk said, noting that the USGS’s Earth Resources Observation and Science Landsat data center is also in Santa Barbara. Continuing in the tradition of USGS monitoring efforts, CHIRPS builds off existing ubiquitous technology — weather satellites, in this case — to create a global product that is accessible to government organizations and private entities alike. A tragic drought in East Africa brought the necessity for such a product to the U.S. government’s attention three decades ago. That expertise in remote sensing was tapped into in the 90s when the United States Agency for International Development created the Famine Early Warning System Network, Funk said. “After the famine in 1984 in Ethiopia, the U.S. government wanted to make sure something like that never happened again,” he said. CHIRPS uses geostationary satellites that date back to 1981, Funk said. The thermal infrared sensors onboard are simple but consistent, and capable of providing long term sets of historical data. Years of collective experience with the satellites has allowed NOAA to carefully calibrate their cloud-top temperature observations, which are available in 3-hour increments for the past 30 years. Tens of thousands of ground-based rainfall stations also contribute to the CHIRPS dataset. Although CHIRPS incorporates data from around the world, the USGS is using it to monitor specific drought-prone regions: Afghanistan, Haiti, Yemen, parts of South America and Africa. The USGS hopes that relief agencies will use the data to recognize and address drought patterns in impoverished regions. Farmers there can also use the data to decide whether to obtain crop insurance. “If you realize that there’s been a drought, then that actually gives you months of lead time before there’s really a crisis,” Funk said.